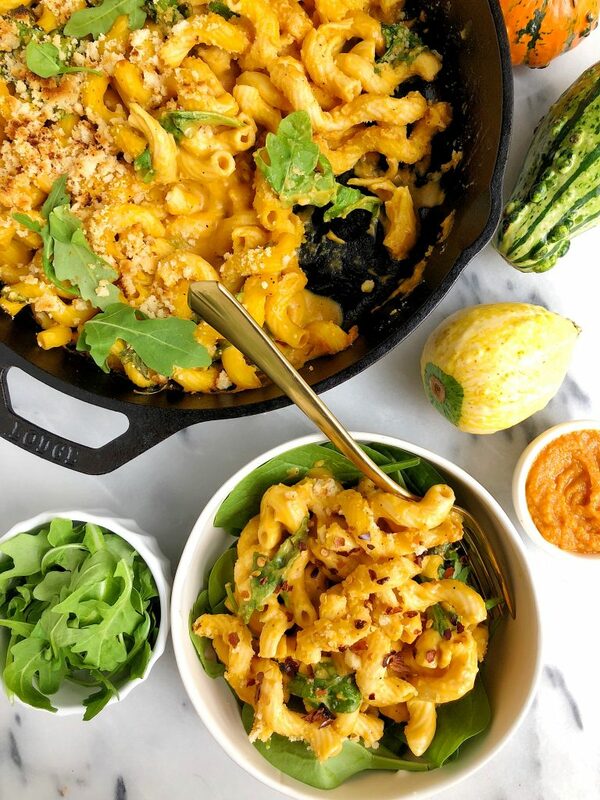 Healthy Baked Vegan Mac & Cheese made with all gluten-free, nut-free and plant-based ingredients for a healthier macaroni recipe! Find me a recipe more comforting and cozy than a homemade macaroni and cheese. It is always a go-to over here and a crowd pleaser. Who says no to mac ‘n cheese?! Especially when it is lightened a bit (okay a whole lot) and made healthy ingredients like this one. Most vegan mac and cheeses I have come across use cream cheese, nuts or tofu to make that cheesy sauce. 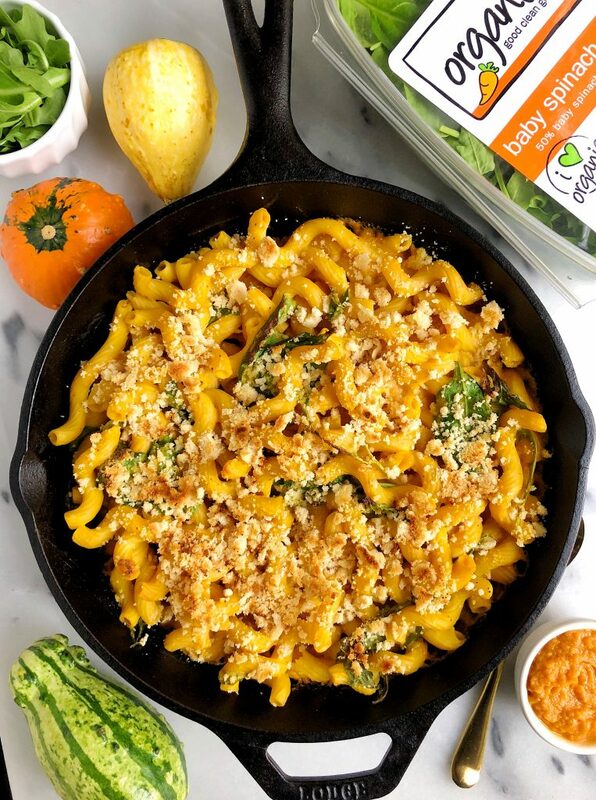 I even have a creamy pasta recipe with cashews here on the blog but I know many of you have a nut allergy, so we are making an epic Healthy Baked Mac & Cheese that is nut-free, vegan and gluten-free. And YES – I promise it still tastes as dreamy as you want it to be. I love that this pasta turns out super creamy and the topping is a bit crispy from baking and broiling it in the oven. I also sneak in some extra veggies from Organic Girl and use their baby arugula and spinach mix. Baby arugula and spinach are always my favorite type of greens to combine together and keep on hand. They get a little wilted on top and softened in the pasta when it bakes. You can also easily blend the greens in the sauce if you’d like as well but I prefer to keep the color as “classic” as possible. To make this cheesy cheese-less sauce, you will need only a few ingredients like full-fat coconut milk, organic sweet potato puree and SO many spices. The more the better if you ask me with spices. I love the hidden cayenne and paprika in the sauce and it adds a subtle but delicious flavor to the macaroni. I usually like to serve this with some chicken or a protein of sorts. I bet adding chicken IN the pasta when baking would be delicious too. Next time I will be trying that for sure! 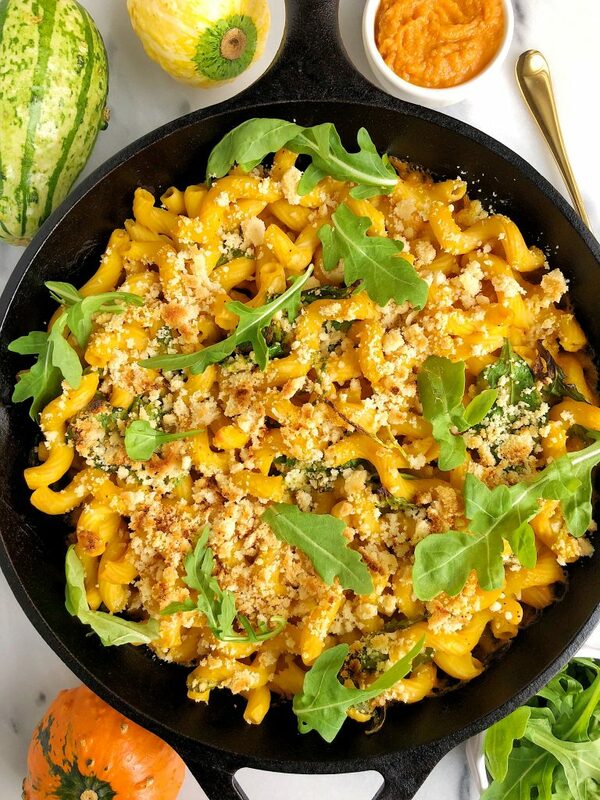 Don’t forget to share your Healthy Baked Mac & Cheese with me on Instagram! I cannot wait to hear what you guys think of this recipe. Here are a few of my other favorite macaroni recipes from the blog too: 5-ingredient Creamy Squash Pasta and Creamy Avocado Arugula Pesto Pasta. Bake in oven for 20 minutes then broil for 1-2 minutes to crisp and enjoy! Thank you Organic Girl for sponsoring this post. It means so much to me to partner with brands and I love and believe in! I’m going to make this tomorrow night for dinner! My girlfriend and I have been trying to implement more and more vegan recipes so I’m sure she’ll love this!